"Reaching out - coming home"
On November 19, 2009 it will be 100 years since Peter F Drucker was born in Vienna – then capital of the Austro-Hungarian Monarchy. Drucker passed away three years ago, on November 11, 2005, in Claremont, California. He is generally referred to as the “father of modern management”. Yet, it appears that his importance as someone who thought about management in a broader social perspective is not widely understood. In today’s increasingly complex and crisis-ridden world we need that orientation more than ever. 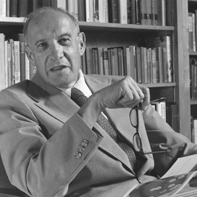 Can we expect help from Drucker’s thinking in coping with the challenges for 21st century management, in particular with regard to its role, its legitimacy and its responsibility? His 100th birthday may be a unique opportunity - not only to remember him but also to perceive him in a new light and to learn from his perspective on management and society. A conference organised by the Peter Drucker Society of Austria in partnership with the EFMD and other institutions will provide a forum for dialogue and reflection on these questions.